The zero draft outcome of the post-2015 Sustainable Development Goals has failed to recognise the caste-based exclusion and discrimination based on work and descent. 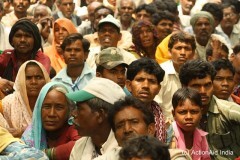 Over 260 million people suffer discrimination based on caste, work or descent who are often trapped in poverty. They are discriminated in every dimension of society such as accesses to education, employment, housing, water and sanitation. Girls and women belonging to those groups often fall victims of violence and gender discrimination. Asia Dalit Rights Forum , a network to combat caste-based discrimination in South Asia, issued a Response to Zero Draft of the Sustainable Development Goals to demand the inclusion of the issues of discrimination based on work and descent. Appeal to the zero draft document was issued with endorsements from various organisations and networks.